Three infrastructure projects supporting the container trade and representing $65.6 million of State and Federal investment were officially opened on 10 November. Warren Truss, Deputy Prime Minister and Minister for Infrastructure and Regional Development, and State Transport Minister Dean Nalder officially opened the Rous Head Industrial Park on reclaimed land, the extension of the rail terminal at North Quay and the construction of a crossing loop at Spearwood. The two rail projects were jointly funded by State and Federal governments at a total cost of $38.4m. The extension of the North Quay Rail Terminal line from 400 to 690 metres reduces turnaround time for trains and achieves a better interface with the two container terminals. The Spearwood crossing loop, which enables freight trains to pass on the rail line connecting the port with the Kewdale/Forrestfield area, increases efficiency and capacity by accommodating more train movements during the day and minimising service delays. The Rous Head Industrial Park opening signified Fremantle Ports’ $27.2m completed development of roads and services on 27 hectares of land reclaimed as a result of the 2010 harbour deepening. 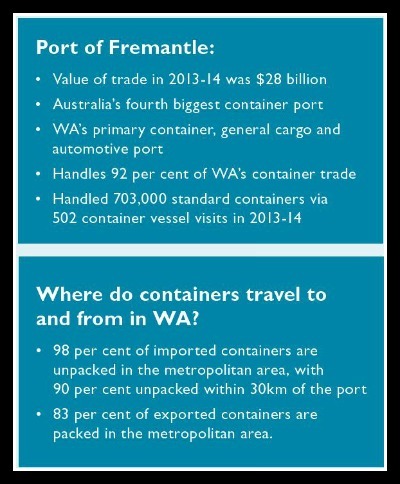 Here are some interesting facts on the Port of Fremantle.